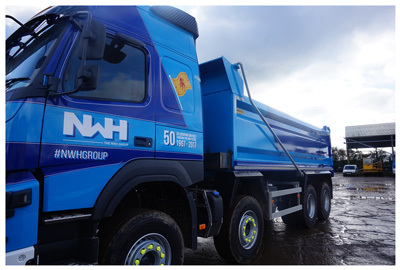 The NWH Group is a second generation, family owned industrial and environmental services business that has enjoyed success operating in the quarrying and waste recycling and collection sectors. In addition to a fleet of tipping vehicles, the business also operates from 8 facilities across Scotland. The business is founded on four simple principles: Safety, Excellence, Customer Focus and Teamwork. Craig Williams, Operations Director for the group, explains how these values inform their business decisions: “Despite the growing nature of our business, we have held onto our family values. In this respect we care about the people who work for us and we care about the customers that we work for. To this end we regularly update our fleet to ensure that we’re operating equipment that meets modern safety standards and offers the best levels of productivity. The CX Series of combined ram and tank tipping gears from Edbro, part of the JOST Group, offers industry leading load capacity, tipping speeds and reliability for operators of rigid vehicles. Thanks to a combination of hi-tech materials and modern manufacturing techniques that allow for a special ‘one-piece’ construction, the CX15 offers significant weight saving as well as a superior power to eight ration against similarly marketed products.